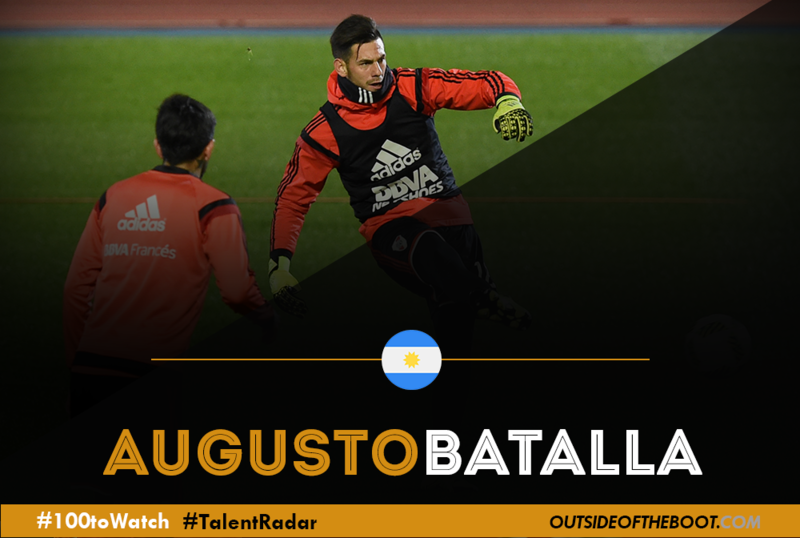 Blurb: Long-regarded as an excellent goalkeeping prospect after his performances for the Argentina U17s and U20s, Batalla has now been handed the gloves at River following the departure of Marcelo Barovero and now has the chance to show what he is capable of for los Millonarios. Analysis: Having joined the club at the age of five, Batalla has worked his way through the age groups, impressing at every step. In 2013, he was voted as the best goalkeeper as River won the U17 World Club Cup and also was an ever-present as the Argentina U17s won the Sudamericano, before reaching the semi-finals of the U17 World Cup in the UAE. And he repeated the feat two years later as Argentina won the U20 Sudamericano in Uruguay, adding to his growing reputation as a future number one for the national team. An excellent shot stopper with great reflexes, Batalla is also a big personality on and off the field and is usually one of the leaders of the teams he has represented. His confidence spreads to his defence in front of him and he displays maturity beyond his tender years, demonstrated by the way he has been able to assume the responsibility of stepping up to challenge of being the number one of one of the biggest clubs in Argentina. A lesser man would have shirked at having to replace club idol Barovero but Batalla has made a promising start to his life in the River goal, despite a constantly changing defensive line in front of him. Inevitably there are still mistakes in his game. He has a tendency to rush off his line, as displayed in the recent Superclasico loss to Boca Juniors, which needs to be improved and he could be stronger at dealing with crosses. Nevertheless, he will learn from these errors and has the personality to use these experiences to become a better goalkeeper. Looking Ahead: Now he has been given the opportunity to be number 1 at River he will look to consolidate his position for the foreseeable future. After a very successful period under Gallardo, the team is going through something of a transition but Batalla has the opportunity to gain great experience that many keepers his age could only dream of. Having represented Argentina at various age groups he will also be hoping he can make the step up to the senior national team. With Geronimo Rulli, Batalla and Axel Werner, the future of the Argentina goalkeeping jersey looks set to be in good hands. 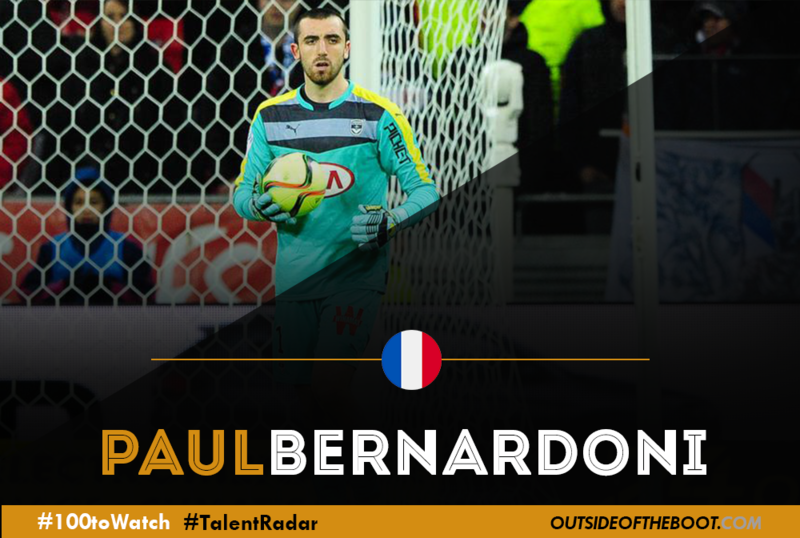 Blurb: Paul Bernardoni’s rise to prominence with Bordeaux has been an uneven one, to say the least. His arrival from Troyes came with great anticipation, having been capped by the Grand-Est club at just 17. A highly successful career with France’s youth international sides had seen him anointed as the long-term successor to Cedric Carrasso upon his arrival in Janurary. The veteran ‘keeper had suffered from uneven form at times last season, and when he was felled by a season-ending knee injury, the club hastened to seek a replacement, bringing in Bernardoni at first on loan and then permanently for 2.5 millions euros this summer. Analysis: He was thrust immediately into the first team upon his arrival, a period which coincided with the team winning only one of his seven appearances, dropping from the fringes of European contention to lower mid-table. The final straw was a 4-0 loss to local rivals (and relegation contenders) Toulouse, a result which saw Bernardoni dropped in favor of Jerome Prior for the rest of the season. Carrasso has continued to struggle with injury this season, and Prior has retained his place behind the veteran, slotting into the first team as his deputy when needed. After an impressive summer which saw him capture the U-19 European Championship with France, hopes had been high that he could regain his place in the first team, joining the team’s array of exciting young attackers (Adam Ounas, Malcom, Gaetan Laborde) in a youth-oriented side. During his spell in the first team last year, Bernardoni demonstrated decent reflexes, but his handling was often horrendous. The absences of first choice pairing Nicolas Pallois and Pablo won’t have helped matters, but the youngster’s command of his area was similarly poor, and likewise his distribution. That said, as a longtime observer of French football, Hugo Llloris was perceived to have similar strengths and weaknesses when he broke into Nice’s first team. For Bernardoni, the raw materials are undoubtedly there, and there is plenty of time to improve those areas in which he is lacking. Looking Ahead: He is still just 19, a remarkably young age for his position; his situation at Bordeaux is a tough one, though – he has moved up internationally to become a regular for the U-20s, but is in desperate need of playing time for his club. His medium-term goals should be to displace Prior as second-choice and to define himself as first choice for the U-21s as they seek to qualify for 2019’s European Championships. Both Mike Maignan and Thomas Didillon have aged out of the group, but Bernardoni will face stiff competition from the likes of Alban Lafont and Luca Zidane. If he can fend off the Toulouse prodigy, and become more involved for his club, he can progress; success under these odds will be a testament not only to Bernardoni’s abilities but also his character. Blurb: The young goalkeeper is a towering presence standing at 6ft 5in and grew up as a Milan fan. Donarumma made his Serie A debut aged 16 and made his Italian National team debut at 17.T hough Milan might have declined in their stature compared to their standards they set the last two decades, take nothing away from the goalkeeping starlet for being the face of the club now. Having been handed his Serie A debut by Sinisa Mihaljovic last season, he has cemented his spot in the starting eleven since then and even found a way to thank Mihaljovic by saving a penalty against Torino, whom Mihaljovic manages now. Milan would go on to win that game 3-2 because of his last minute heroics and in the process he has also become the youngest player to have stopped a penalty in Serie A. Analysis: Donarumma is a goalkeeper with excellent reflexes and is extremely agile for a player of his height. His big frame can be misguiding as he can get low quickly to keep shots out. His tender age has not stopped him from being vocal and is an excellent organiser of his defense. Despite his age, he has not shrunk away from being vocal with his senior team mates in front of him. This quality in particular is striking as it is something that has to come naturally and it is all the more appreciable that Donarumma possesses this in such a young age. His command of the area is excellent and his height helps him in gathering crosses easily. His handling of the ball is very good too. He put in a lot of high quality performances last season to help Milan gain points where they might have lost easily without him. His composure and the way he has accustomed to the top level of football have been admirable. He has not got carried away with the appreciation he has received and looks to keep improving. Being a modern day goalkeeper, Donarumma needs to improve on his distribution of the ball as he averages only 68% passing accuracy. His tendency to rush out helped him avert danger during his games with the youth squad, but has been error prone in that aspect for Milan at times. The plus for Donarumma is that these qualities can be improved with practise and match exposure, something which he can be assured of. 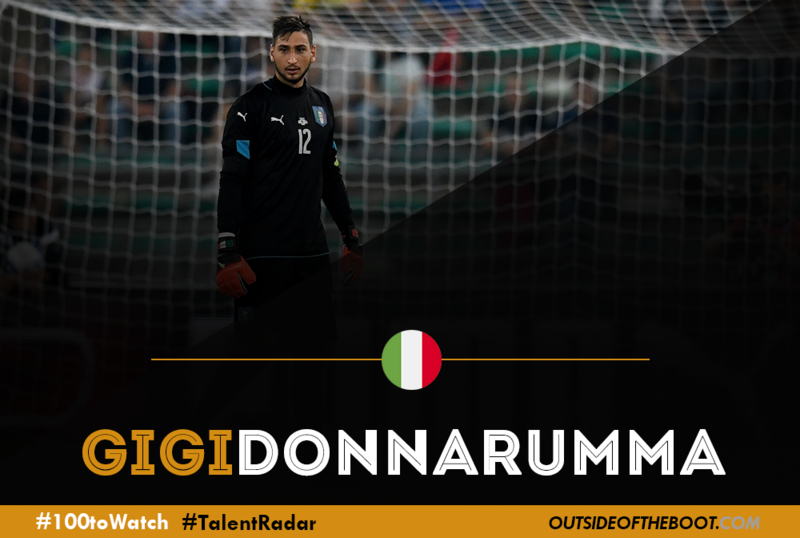 Looking Ahead: Having grown up idolising Gigi Buffon, Donarumma is the youngest ever goalkeeper to have played for the Italian National team. He looks to be following in his steps as he seems to be destined for stardom with his qualities ever improving. He would do good to stay at Milan for a few more years where he can definitely keep improving. Things look bright for this young star and hopefully he can go on to have an illustrious career similar to what his idol Buffon has had. Blurb: Poland has a history of producing quality goalkeepers. Active goalkeepers today include Fabianski, Szczesny and Boruc. Bartlomiej Dragowski is the next quality goalkeeper in making as he moved to Fiorentina this season. Dragowski made his professional debut for Jagiellonia Bialystok in the 14/15 season and was named Best Goalkeeper and Discovery of the Season that year. He then put in top quality performances last season too, which lead to the scouts coming in from all over Europe, before Viola sealed the deal. Analysis: Bartlomiej Dragowski, son of Dariusz Dragowski, who also played for Jagiellonia, feaured 64 times for the club before his move to Fiorentina. Even at this young age he was the first choice goalkeeper for his hometown club. The most impressive aspect of his game is that he reads the game well and anticipates situations accordingly. His goalkeeping technique is based upon his positioning in goal, which allows him to make the saves. He has an impressively calm demeanour about himself and does not buckle under the pressure. When faced with one on one situations or hasty back passes, the youngster does not panic and reacts well to the situation. Dragowski’s composure is his strongest asset and he is a good distributor of the ball too. He can help build from the back and does not get fazed when facing high pressing opponents. 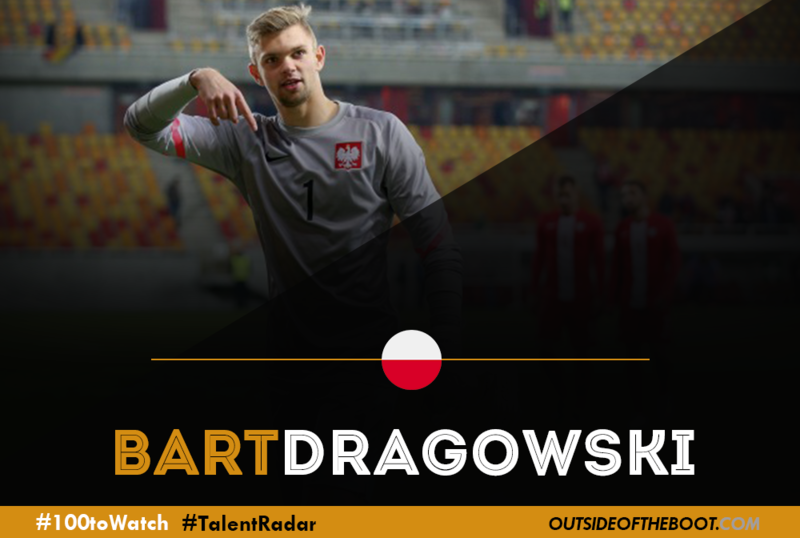 Dragowski is a classical type goalkeeper who puts emphasis on positioning and anticipation, but his reflexes are no lesser in any way as he has pulled off some breath taking saves. “Many people tell me I am talented, but I have something programmed inside me which means I do not listen. I don’t want to hear these complimentary words because there were many talented players who quickly disappeared. I do not want to be the next.” These words said by Dragowski himself, shows that he is not carried away by the praise he receives and looks to keep improving. Looking Ahead: It is still early in his playing career, so the exposure to quality team mates will help him. He has strong competition in his National squad and this can serve as motivation for him to improve. Age is on his side as he can surely go on to be his country’s first choice goalkeeper in the coming years. Right now, it is all about grabbing the opportunities he gets at his club and establish himself as the great talent he is. Blurb: 2015-2016 has been a splendid season for both Goran Karacic and his team Zrinjski Mostar which won the Premier League of Bosnia and Herzegovina for the fourth time. 19 year-old goalkeeper took the stage in 24 of total 30 games and played a fundamental role in the road to the success. He has also represented his country in all of the youth categories. Eventually, he was called up to Bosnia and Herzegovina national team in May 2016 but unfortunately had an injury and lost his chance of debut for national team. In July 2016, he joined Turkish club Adanaspor signing a four-year contract. Analysis: For a goalkeeper, it is generally important how you look in front of the goal. What makes Karacic impressive in front of the goal is his 1.96 meter height and 86 kg weight. As one of the tallest goalkeepers in Turkish Super League, Karacic has also displayed his impressive reflexes Inside the box, Karacic covers the goal well thanks to his physical quality and seems really confident saving close range shots. With good and hard work, he has the potential to be one of the best at it, in the league. When it comes to long range shots though, Karacic has got some trouble. He seems to be a little late at reacting to long range shots. This problem was obvious in the goal he conceded against Galatasaray’s Bruma who scored a long range shot and defeated Karacic who had performed really well up until that point. However, this problem may arise from Karacic’s self-confidence (or lack of) and surely is not an insoluble problem for the youngster. 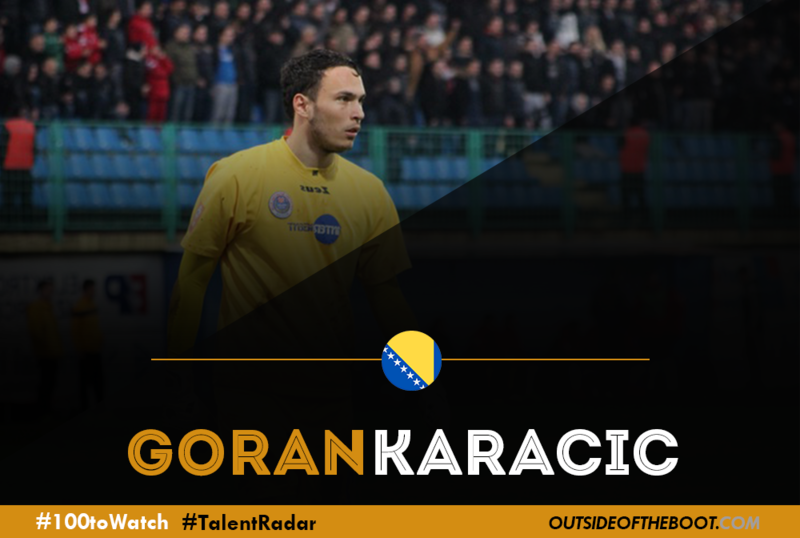 Looking Ahead: Already having had a domestic title, playing regularly at club and youth national level and seeming to be a candidate for national team also; the future ahead for Goran Karacic is bright’. Turkish Super League is also a great platform for Karacic since he is playing against famous players and well-known clubs of Europe like Galatasaray, Fenerbahçe and Beşiktaş. This opportunity may give him to show his talents and to be a part of his national team again. Blurb: Born in Ouagadougou, the capital of Burkina Faso, Lafont travelled as a youngster with his father to live in France following his parents’ separation. He began his career playing as an attacking-midfielder at amateur level before later converting to a goalkeeper. His prowess in goal soon caught the attention of Toulouse who snapped him up in 2014. He made his debut for the club a year later and in the process became the youngest goalkeeper to ever play in Ligue 1 at the age of 16 years and 310 days, breaking the record previously held by Mickaël Landreau. Analysis: Lafont’s introduction into Toulouse’s starting XI last season was something of a Hail Mary by then manager Dominique Arribagé who handed him his debut at a time when Toulouse were languishing in the relegation zone and ten points clear of safety. Arribagé lost his job soon after but Lafont stepped up under the guidance of Pascal Dupraz and went on to keep 8 clean sheets for the season, helping Toulouse pull off one of Ligue 1’s greatest escapes. Toulouse’s goalkeeping coach Andre Biancarelli recently lauded Lafont’s maturity and highlighted his reading of the game as one of his strongest attributes. These traits, coupled with cat-like reflexes and an impressive control of the ball have seen Lafont become a leader in Toulouse’s defence in spite of his tender age. At 1.93m, the French youth international also stands taller than senior compatriots, Hugo Lloris and Steve Mandanda, and he has used this height to assert himself as a dominant presence between the sticks. Indeed, Lafont’s form in goal has seen him become such an important feature for Le Tefeche that at the time of writing he is one of only four players across Europe under the age of 20 to have played in all of his club’s league matches this season, and one of only two to have played every minute. Looking Ahead: Remaining at Toulouse for the time being would be best for Lafont’s development, but the youngster is already being courted by a number of top European clubs despite him signing a new five-year contract at the start of the season. 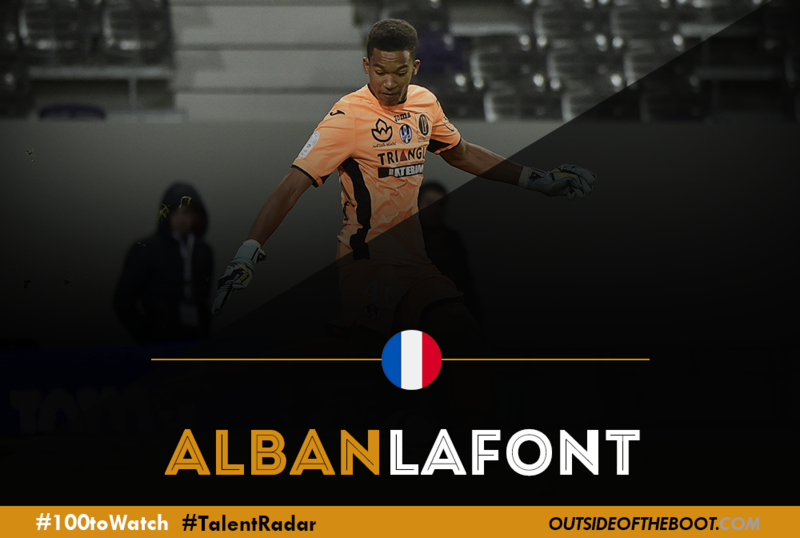 For the France national team, Lafont will likely have to work his way through the ranks at the various youth levels before receiving a senior call cup. Given his current trajectory, however, it seems almost a certainty that he will feature in goal for Les Bleus at some point in the future. At 17, Lafont is perfectly poised to assume the mantle held by Lloris when he retires and make himself a mainstay in the France side for years to come. Blurb: As Russia approaches hosting the 2018 FIFA World Cup and in the wake of the Russian national team’s disappointing showing at Euro 2016, expect a fresh wave of young talent to be introduced to the team from now until the beginning of the tournament. 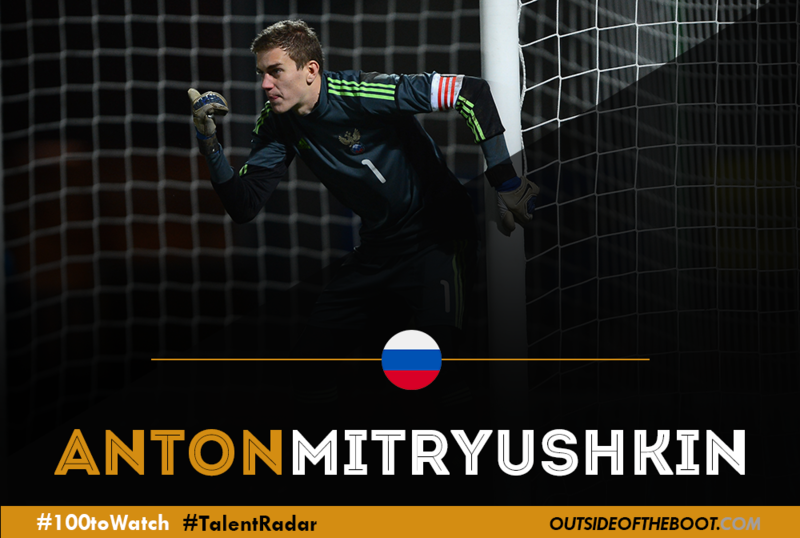 In 20 year-old FC Sion goalkeeper Anton Mitryushkin, the national team may now finally have some long-term competition and a potential successor to long-term number one national team goalkeeper Igor Akinfeev. Analysis: When FC Sion signed the then 19 year-old Mitryushkin from Spartak Moscow for a fee of around 325,000 pounds in Feburary 2016, it was a transfer that to the untrained eye did not raise many eyebrows, however, research a little deeper and it is quite a coup for a club of Sion’s modest stature to land Mitruyshkin. He was the starting goalkeeper for Russia’s victorious 2013 UEFA Under 17 European Championships. The Under 17 Championships were also a personal triumph for Mitryushkin as he won the best player of the tournament award. Two years later, Mitryushkin was once again winning plaudits for Russia’s national youth teams as he was voted into the team of the tournament during the 2015 UEFA European Under 19 Championship as Russia finished as runners up to eventual winners Spain. Despite his successes for the Russian youth teams, Mitryushkin could not displace veteran Russian goalkeeper Artyom Rebrov at Spartak and was left frustrated with life on the bench as the number two; he took a brave decision to leave the comforts of his home country and test his talents abroad at Sion. Since signing, Mitryushkin has improved continuously and is now showing the potential which made him a star for Russia’s national youth teams. Having watched Mitryushkin during Sion’s recent 2-1 defeat against St Gallen and numerous highlights of his performances this season, he is a key reason why they are currently sitting fighting at the top in the 2016-17 Swiss Super League. Mitryushkin’s strengths include covering his near post well from shots, one-on-one saves, one-handed diving saves and good decision making when it comes to coming and subsequently opting to either catch or punch at crosses and corners. Looking Ahead: Having starred for Russia’s youth teams at Under 17 and Under 19 levels, and being a current regular for the Under 21 Russian national team, could see him challenge and eventually displace Akinfeev as the long-term starting goalkeeper and potentially star for his country at a home World Cup in 18 months time. Blurb: While there can be no doubt at the criticism which can and should be levied in the direction of the national team of Netherlands, at club level, so many are still doing it right. If the nation of windmills and canals (oh, and such wonderful cheese) can take pride in their work, surely then Ajax Amsterdam are happy to remain the standard bearer. No other club is more synonymous with youth football, arguably in all of Europe, than De Goden Zonen. For all the brilliant players to grace the club over the years, only one keeper, Edwin van der Sar, has reached the clubs hall of fame. In truth, the club have struggled to produce a consistent top quality keeper. 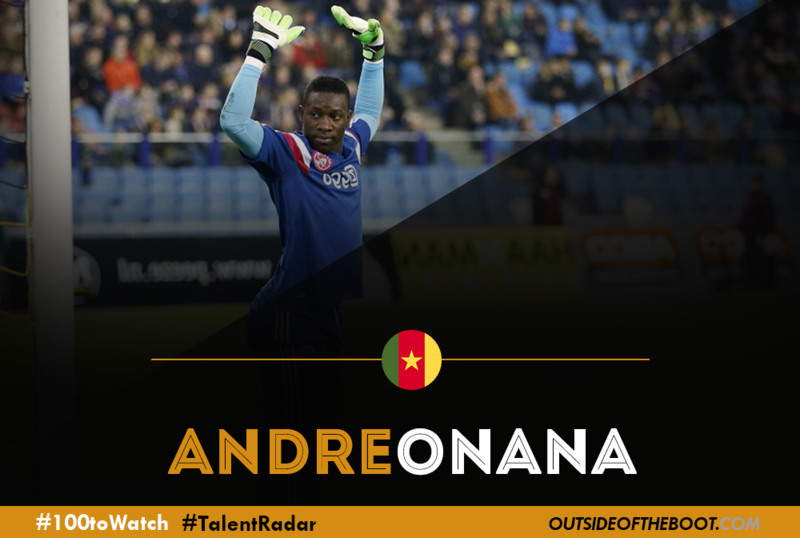 One young player who could be in the midst of changing all that, is Andre Onana. Analysis: Hailing from Nkol Ngok, the Cameroon shot stopper is not a product of the club, but he is in fact a product of a club modeled after the Dutch giants. Beginning his footballing education at the Samuel Eto’o Academy in Laikipia, Onana would then move to Barcelona and their famed La Masia academy at the age of fourteen in 2010. Here, amongst some of the best youth prospects in Europe, Onana would come through the ranks before advancing to Barca Juvenil B, and then Juvenil A. Considering the direct link and affiliation existing between Barca and Ajax since 2007, Ajax scouts felt it prudent to alert the club to push for a move – with Barca having Marc-Andre ter Stegen and (at the time) Claudio Bravo, Onana’s development for the long term would clearly have been better served elsewhere. In the summer of 2015, Ajax signed the player for a paltry 140,000 euros. After making thirty-nine appearances for Jong Ajax, he was promoted to the first-team this past summer under new manager Peter Bosz, whose faith in the progression of youth has done wonders for the 20-year-old. At the time of writing, Onana has made nineteen appearances for the club this season, including starting twelve of Ajax’s fourteen Eredivisie fixtures, as well as five in the Europa League. All told, he’s registered nine clean sheets in the process, and while some, if not many, will attribute that to Ajax’s impressive defensive options, Onana has certainly played his part as well. As with most young keepers in the current footballing climate, Onana has already proven himself to be a more than solid shot stopper, from both long range efforts and shots in the area. His athleticism and quick reflexes are certainly notable attributes, but his composure when under pressure is equally if not more impressive, considering his age. Averaging a shade under two saves per ninety minutes, and 2.63 saves per goal allowed, he consistently makes the stops that he should be, which is a trait you want to see from a keeper so tender in age. Where he needs to improve however, is his ability to distribute at greater distances. Currently, his distribution percentage sits at 80%, but the average distance of his passes is only 25m, keeping in league with allowing Ajax to build from the back. His judgement on aerial balls also needs to improve, but what 20-year-old keeper has the judgement and awareness to excel in the air…few, if any. Still and yet, Onana shows quite a bit of promise, which should have Ajax supporters feeling optimistic for a future that could finally once again contain a keeper of consistent quality. Looking Ahead: When you consider that most keepers do not reach their prime years until twenty-eight, it’s hard to project where Andre Onana may be eight years from now. That is quite a considerable amount of time for a player to continue to grow and mature. What is likely, however, is that he will continue to improve a great deal. Having already been at two of the world’s biggest clubs, both of whom specialize in youth development, it’s unlikely that his career will stagnate. There is no telling if he will remain at Ajax long down the road, move back to Barca, or move to another large club, but what is certain is that as long as he progresses, he’s likely to fight with Sevilla’s Fabrice Ondoa for the role of long term replacement for Carlos Kameni at the national team. Blurb: Standing at 6ft3in tall, Josip Posavec is one of few bright sparks in an otherwise forgettable Serie A campaign for Palermo this term. 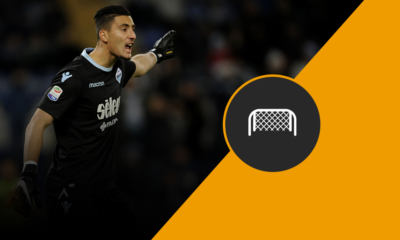 The 20-year-old goalkeeper has started every league match this season (at the time of writing) and despite a shaky back line in-front of him, makes important saves to help out as the last line of defence. 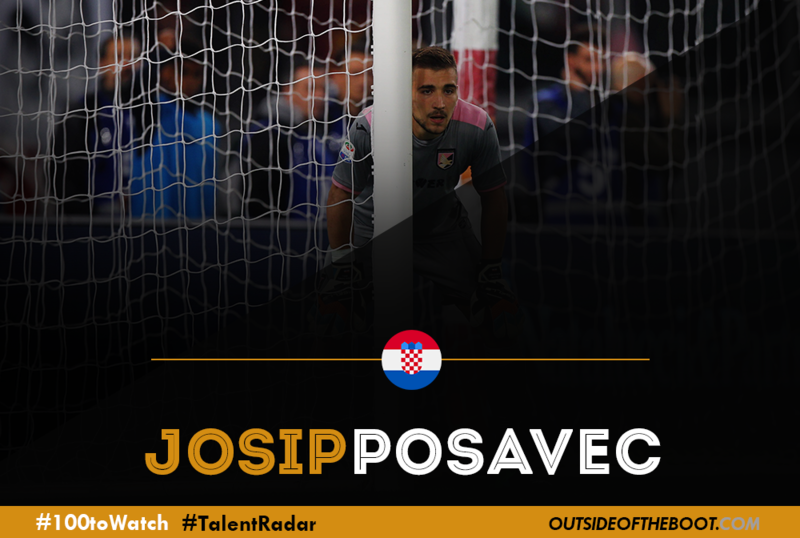 Analysis: Posavec joined Palermo in January this year, having played for Inter Zapresic in the Croatian first division up until then. It was seen as a step-up in quality and one where he’d get more recognition for his performances across Europe, a league with significantly more TV and media coverage – but he has remained fairly under-the-radar due to Palermo’s poor form. Having had three managers since September this year, it’s evident that unless things change drastically, Palermo are staring relegation in the face: through no fault of the Croatian, who also happens to be the club’s youngest first-team starter. His reflexes help him to make a string of spectacular reaction saves from close-range, especially in positions he shouldn’t be ought to make dramatic interventions in the way he does. His main weakness is maintaining concentration throughout matches, especially during periods where he has limited involvement, as the speed of counter-attacks can prompt strikes from all kinds of angles at an unpredictable rate. He can concede a few long-range efforts that you’d expect him to save, whilst his tendency to punch and parry can often be more of a hindrance than a help as defenders rarely tend to protect him. Looking Ahead: It’s all part of the learning process for the talented youngster, who will continue to improve with more matches under his belt as his confidence increases. Having made more saves this season than the likes of Wojciech Szczesny, Joe Hart and Gianluigi Buffon at some of the league’s best teams; it’s unlikely that his performances will warrant relegation in the same way most of his team-mates do if they are demoted to Serie B this term. Blurb: 18-year-old Dinamo Zagreb goalkeeper Adrien Semper impressed in the UEFA Youth League and signed his first professional contract with Dinamo earlier in 2016. He has featured in six league games this season and crucially started against Lyon and Juventus in the Champions League as well, a huge achievement for the 18-year-old. 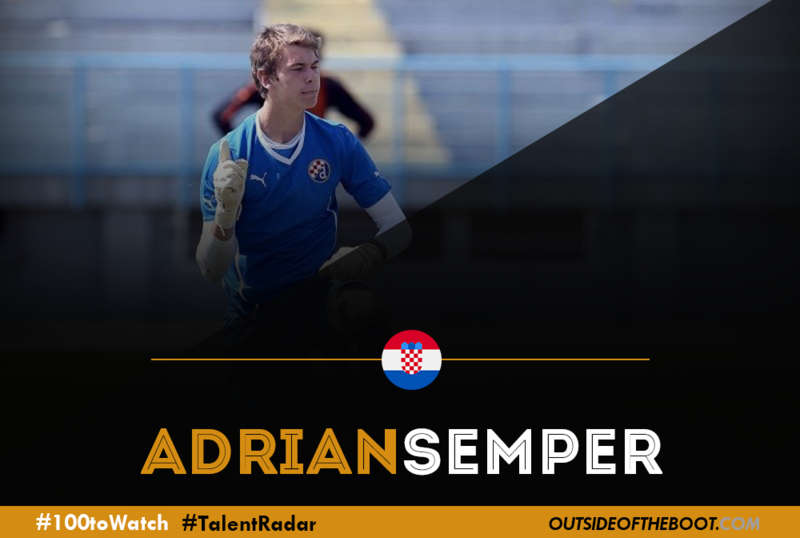 Semper was part of the Croatian team that reached the quarter finals at the 2015 UEFA U17 Championship in Bulgaria and represented his country in the FIFA U17 World Cup in Chile in the same year. In 2016, the player got promoted to the U-19 side. Analysis: The 18-year-old stands tall at 6 ft 4 inches, which is automatically a huge plus point for a goalkeeper. In fact, it’s often considered a prerequisite. He can thus command the air with authority. He possesses a great leap which helps him guard the penalty area. One of his more impressive attributes is his impressive reflexes. He also shows an incredible degree of calmness and maturity for a young player. There is of course, immense room for improvement, which is the case for most teenagers who have broken out in big teams. Semper needs to do even better while defending crosses and long balls. His distribution and kicking are also attributes that can be worked upon. A goalkeeper should be vocal and talk to the defenders to ensure there is a symbiotic relationship at the back which helps the team’s case. Semper needs to be more vocal and imaginably it’s his young age and natural shyness that comes with it that sometimes curbs him. His strengths though, considerably outweigh the weaknesses in his game. The Croatian’s poise and assurance at the back stems from his technical qualities and temperament that subsequently ensures that he adopts a very proactive style of goalkeeping. Looking Ahead: Semper is not a finished article, and has a lot of room for improvement. He needs an extended shot in the first team before he should even think of making a move away from the club.